This, the oldest surviving galleried inn in the United Kingdom, was originally built as a pilgrims’ inn to house visitors to the shrine of King Edward II in nearby St Peters Abbey. However, the building fell into disrepair and was subsequently reconstructed in 1455 (hence the title “The New Inn”). Unsurprisingly, the building itself is Grade-I listed. Its main historic significance, however, is that it was while staying at The New Inn in 1553 that Lady Jane Grey was pronounced Queen - a title she would hold for a mere nine days. It has also been suggested that William Shakespeare may have visited the inn with his theatre company, but there is no supporting documentary evidence. The New Inn Gloucester offers 33 guest rooms (all en suite), with a number of them possessing some notable architectural detail such as timber beams and panelling (as in the oldest of all the rooms, the Oak Suite). The Lady Jane Grey Suite also features a four poster bed. 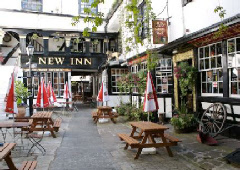 The New Inn is 3 star rated and features a restaurant and bar.